“I simply like to give back, and when I find an organization that’s doing great things, I feel it’s my responsibility to join in the effort,” says Jared Thomas. He’s a husband, father, volunteer and owner of Stratus Building Solutions of Salt Lake City Metro. The business, much like every other aspect of his life, is a family affair. Thomas’ wife Emily is Chief Financial Officer, daughter Sydney serves as a utility player, filling any and all voids as needed. At 12 years old, Thomas’ son Cedar is still too young to help out at the family-run shop. However, that doesn’t necessarily mean he’s not putting in hard work. In April, Jared and Cedar joined the adoption advocacy organization A Child’s Hope Foundation on an important trip to Mexico. Among its many focuses, the organization builds orphanages. It’s a trip Jared has taken several times in the past, but he was ecstatic his son joined him this time around. 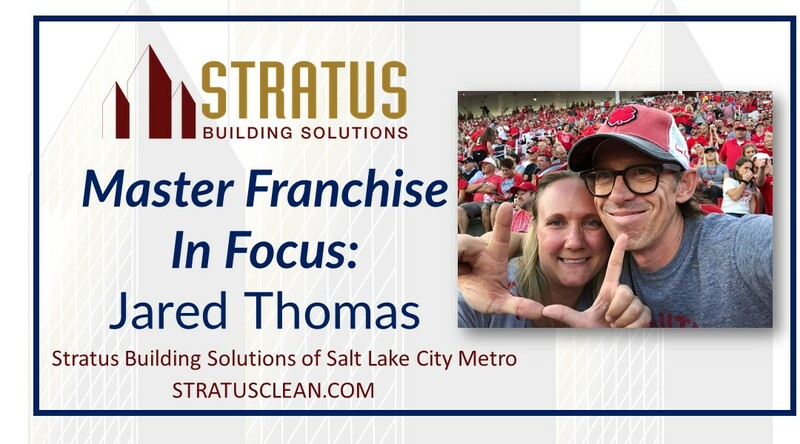 As he enters his ninth year with Stratus, Thomas is proof you don’t have to have a background in sales or marketing to find success as an owner of Stratus Building Solutions. “I spent the majority of my professional career as a facilities maintenance manager,” says Thomas. That experience proved to be beneficial as he and his wife began discussions about their future. Thomas says his wife, with a background in business, was actually leading the charge to take control of their lives, personally and professionally by going the entrepreneur route. Days after Thomas signed the paperwork and sent the check to join the ranks as one of America’s small-business owners, life threw him in the deep end. Two days after mailing the check, Thomas received a shocking discovery — he had cancer. Thomas flew out to corporate for training. What was supposed to be a two- to three-week process, was whittled down to one. When he returned home from training, Thomas underwent surgery. Together, they’ve grown a successful business in the Salt Lake City metro area. The business they started under trying circumstances nearly a decade ago is now responsible for creating 160 new business ownership opportunities. Additionally, his regional office employs more than a dozen people. Jared Thomas’ quest to change lives knows no borders, ages or backgrounds. Would you like to enjoy a work-life balance such as Jared’s? Does the Stratus Building Solutions franchise opportunity sound like it could be for you? If so, learn more at http://www.stratusclean.com/.